XML is labelled tree, a special case of graphs. So, why there are separate XML databases and why is it that XML is not stored in graph databases? At a first glance it seems so easy - one should map XML parsing and storing operations to graph database insert/update operations and one should translate XQuery queries to the Gremlin queries. There could be small layer that can convert every graph database into XML database. It seems so easy and self-evident. But, as far as I have searched the Web, there is no such layer. All the XML databases are not just layers atop graph database, they are standalone projects. This question about differences between XML and graph databases is even more actual when one observes that there are just few (unconvincing) open source XML databases whose scalability can be an issue (and there is one very reliable commercial XML database - Clusterpoint, I guess that BaseX is the most serious open source XML database) but there are several very scalable and serious graph databases (e.g. JanusGraph). So, maybe creating the mentioned layer atop a scalable open source graph database is the viable path to create scalable open source XML database? Generally, do graph and XML databases use completely different algorithms in their implementation? What makes them different and why can one not consider/implement an XML database as just a specialization of the graph database? I am asking just about general concepts and about names of algorithms, no specifics are required. The Bar node is shared and we can query for all nodes connected to Bar. In an XML database, that's intentionally not possible. While an XML database could internally be stored in the same way as a graph database, it probably wouldn't be a good fit because the difference in access patterns. In an XML database users will be updating entire documents where the structure could change dramatically, and they'll be searching for documents that match certain values in certain nodes. With a graph database users will be updating relationships, changing nodes, and they'll be traversing relationships. Most databases can be used to model other kinds of databases. 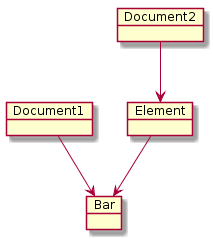 For example a relational database can be used to represent a graph (see sql-g). A graph database could represent an XML document. The key difference between database types is their focus and intended access patterns that they've designed the database for. Not the answer you're looking for? Browse other questions tagged algorithms database xml nosql graph-databases or ask your own question. Why put a simple query into a stored procedure in a web service? What functionality to expose in a database abstraction layer? Might this be a good candidate for a graph database?